Thanks to the Dental Center of Jacksonville, the residents of Baymeadows are only 10 minutes away from the comprehensive dental care that can give them the healthy and beautiful smiles they desire. Dr. Jignesh Patel provides a practice that puts the needs of patients before anything else, and he is confident that everyone who comes to see him will feel that as soon as they walk in the door. Going to the dentist doesn’t have to be unpleasant, and we go the extra mile to give you an easy and stress-free dental experience. We have amenities such as neck pillows, warm towels, and even a beverage bar to help you relax both before and during your treatment. Anesthetic has been used for years to prevent patients from feeling pain, but we go a step beyond simply using it: we even make sure administering the anesthetic is painless. We use DentalVibe technology so you won’t feel anything during injections and extra-strength topical gels to make sure you’re completely numb before we begin any treatment. When you’re with us, you’ll never have to go anywhere else to take care of your teeth. 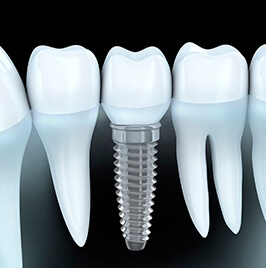 We can provide everything from standard check-ups and cleanings to complicated oral surgeries like dental implant placement and wisdom teeth extractions. If your smile needs something, you can trust that we offer it. Everyone in your family has a home at the Dental Center of Jacksonville. We can help small children ease into going to the dentist, replace dentures for seniors, and help everyone in between. No matter who needs treatment, we can provide them top-quality care they won’t find anywhere else. 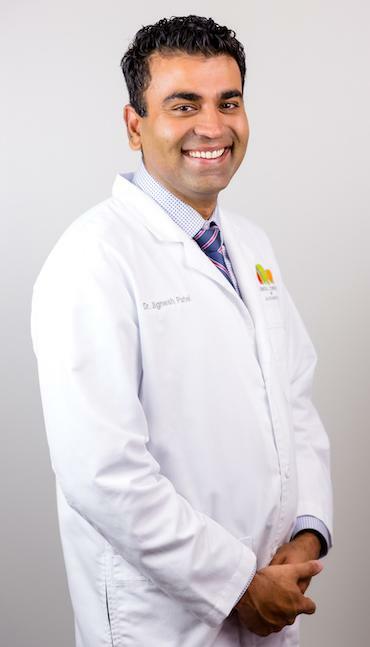 Dr. Jignesh Patel is extremely proud to provide dental treatment to the community of Baymeadows in a caring, comforting, and friendly environment. He began his career at Nova Southeastern University in Fort Lauderdale and has since settled in Jacksonville with his wife. Throughout his career, he has expanded his skills in order to provide exceptional dentistry, and has refused to settle for anything less. 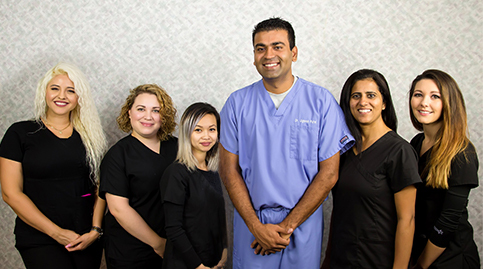 Dr. Patel’s philosophy of practicing dentistry involves always putting his patients’ needs first. Too often in the healthcare community, patients are not recognized as people and are simply treated as a set of problems. Dr. Patel believes it is vital to value a patient’s feelings, background, interests, and experiences so treatment can be tailored with care and compassion. Patient comfort and ensuring an outstanding dental experience are always his main priorities. We are located just a 10 minute drive south of Baymeadows. First, get on Southside Blvd. and take it all the way to I-95 S. After that, take the exit for Philips Hwy N and then take a left on S Gazebo Park Pl. We’ll immediately be on your left! We’re located right next to Allstate Insurance, Perry-McCall Construction, and just down the street from Regal Cinemas, Steak ‘n Shake, and Benito’s Italian Café and Pizzeria. Here is just a sample of what we can offer you every time you come to see us. As you can tell, we have just about everything your teeth need now or in the future. If you’d like to learn more about individual treatments or see our full menu of services, be sure to click on the links. If you still have questions, don’t hesitate to call us! We have everything to help you stop dental problems before they even start. Two check-ups each year are all you need to have a smile you never have to worry about! If you have damaged, decayed, or even missing teeth, we can help make your smile whole again with our variety of natural looking restorative options. Want your smile to truly light up a room? With our cosmetic treatments, every aspect of your teeth can be enhanced to give you a confidence that everyone will notice. Unlike most other offices, you only need to come see us to get the most reliable and long-lasting solution available for missing teeth. 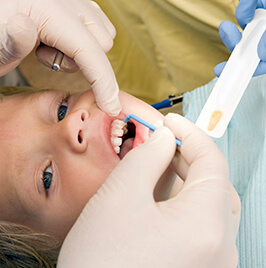 We provide the gentle and patient care that your littlest smile needs. We can also educate them in ways to help establish basic habits at home. You can get the straighter smile you’ve always wanted without having to get metal braces! Our orthodontic solutions look better, feel better, and take less time. 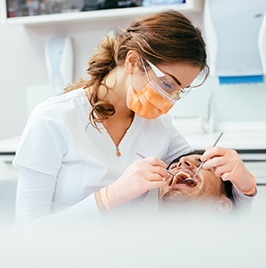 Whether you are a little nervous or completely terrified about going to the dentist, we will always listen to you and provide sedation to help you have the easiest dental experience of your life. 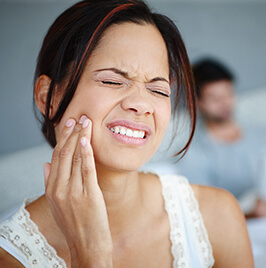 If you suddenly injure your teeth or gums, be sure to call us first! We can quickly get you the exact treatment you need to relieve your pain and save your smile. Even if you don’t see your provider’s name on this list, we will always work with your insurance to get the most out of your benefits. If you don’t have insurance, no problem! We also offer our own in-house Dental Savers Plan. It has all the benefits of insurance (such as free preventive care and discounts on other services), but it has no yearly maximums, no deductibles, and no waiting periods. It is the best way to get affordable dental care if you don’t have insurance. If you’d like to learn more about all of the benefits and how to sign up today, you can learn more here. Contact Our Dental Team Near Baymeadows Today! We’re sure that after reading all of this that you know we’re more than worth the short 10 minute drive from Baymeadows. 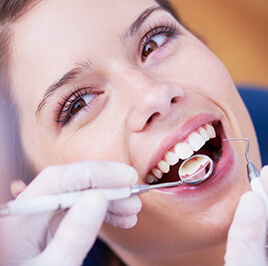 Everything we do is to make your smile healthy, beautiful, and give you a dental experience unlike any other. If you have any questions about our services, the Dental Savers Plan, or are ready to schedule an appointment, just give us a call today. We can’t wait to help your smile.